Samford University received positive news Dec. 5 when the Southern Association of Colleges and Schools (SACSCOC) reaffirmed the university’s accreditation for the next 10 years. SACSCOC is the regional accrediting body for 11 states, including Alabama. 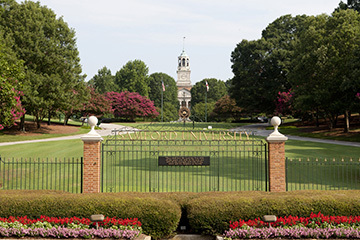 Samford first received accreditation in 1920. The action was the culmination of a multiyear review process that included internal studies involving hundreds of people on campus and culminating in a March 2017 site visit by a peer review committee from SACSCOC. The process was coordinated by Katrina Mintz, assistant provost for assessment and accreditation, and the Office of Institutional Research and Assessment. Mintz noted that SACSCOC has approved new standards, and these will be part of the university’s review process for the required five-year interim report in 2022. The standards are “greatly improved,” Mintz noted. Mintz also stressed the importance of the reauthorization of the federal higher education act in the future review process. “This is an ongoing process of continual improvement, and we will continue the conversations between Samford and SACSCOC to ensure that we make gains in every area of the university – academics, student services, governance, academic freedom, effective support, physical plant – all of which are focused on achieving positive student outcomes,” Mintz added. A part of the recent accreditation process was the review and approval of Samford’s new Quality Enhancement Project (QEP), “Level Up: Learning through Powerful Assignments.” The project focuses on the connection between increased investment in faculty development and improved student learning. The QEP was an important and required step in the 10-year reaccreditation process, and a university-wide team worked for more than a year to develop and refine the proposed project. The QEP team was led by Eric Fournier, director of Samford’s Center for Teaching, Learning and Scholarship. The major emphasis of Level Up is helping faculty develop powerful assignments, Fournier explained. Primary student outcomes will relate to information literacy and critical thinking.